For the month of October 2010, we decided that for KidsTown Live! we would share with the kids about monsters. No, not the kind that we see in movies that hide under our beds and drool or peak out of our closet at night with scary eyes. We all know such "monsters" are only found in movies. However, for each of us, we do have things in our lives that are very much like monsters, that haunt us every day causing us to worry about when our problem or fear is going to catch up to us and grab us or we lie awake at night in fear or anxiety about something. God however does not want us to live in such a way. As it says in II Timothy 1:7, He has not given us a spirit of fear, but a spirit of power, of love, and of a sound mind. All month we talked about different kinds of "monsters": the mystery monster, the failure monster, the mean monster, and the scary monster. 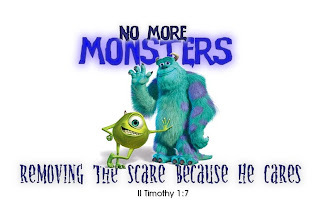 We concluded our month's topic with a special skit show that was a spiritual re-write, or as I like to call them, a parody parable on the Disney Pixar movie, Monsters Inc.
To download this photos and see others, click here. If you need instructions in loging in to Snapfish, click here. If you'd like a dvd copy of this show, please contact Pastor Josh. Read a special article on lead actor, Bailey Littrell, by clicking here.